GROUPING_ID function computes the level of grouping. Syntax : GROUPING function is used on single column, where as the column list for GROUPING_ID function must match with GROUP BY column list. 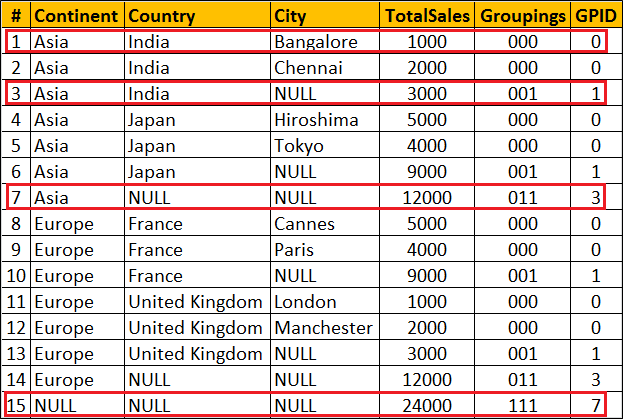 GROUPING indicates whether the column in a GROUP BY list is aggregated or not. Grouping returns 1 for aggregated or 0 for not aggregated in the result set. 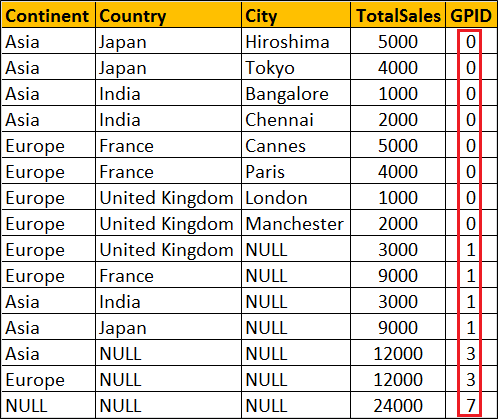 Row Number 1 : Since the data is not aggregated by any column GROUPING(Continent), GROUPING(Country) and GROUPING(City) return 0 and as result we get a binar string with all ZEROS (000). When this converted to decimal we get 0 which is displayed in GPID column. Row Number 7 : The data is aggregated for Country and City columns, so GROUPING(Country) and GROUPING(City) return 1 where as GROUPING(Continent) return 0. As result we get a binar string (011). When this converted to decimal we get 10 which is displayed in GPID column. Row Number 15 : This is the Grand total row. Notice in this row the data is aggregated by all the 3 columns. Hence all the 3 GROUPING functions return 1. So we get a binary string with all ONES (111). When this converted to decimal we get 7 which is displayed in GPID column. Use of GROUPING_ID function : GROUPING_ID function is very handy if you want to sort and filter by level of grouping.